Did you take a look at the 2015 Gartner Hype Cycle report yet? We did and if you do a bit of digging on the cloud front, it looks like learning is not happening fast enough as we go through the Hype Cycle. Most of your clients are probably using cloud or have a cloud strategy in mind. What are you doing to support them through this transition? Cloud and big data are no longer hype, reality has set in. Cloud and big data are proven to be effective as more than a form of IT outsourcing. Cloud and big data are central to business improvements and form the foundation of strategic innovation for many companies. However, there are major gaps in cloud understanding, and the cost of adoption is inflated by this as companies rethink their use of cloud and the initial decisions they have made. As a training provider, you may find it interesting the skills gap is a key factor in this, cloud certification is not visible in the market. Last year we talked about obtaining the right cloud skills on this blog, this time we did a broader analysis to see what’s out there. This is what your clients may want to look at. First let’s set the scene. Cloud computing and big data remain a megatrend and continue the expected trajectory along Gartner’s Hype Cycle. This year cloud and big data shifted from the Peak of Inflated Expectations, slowly descending to the Trough of Disillusionment as reality sets in. More and more companies are adopting cloud and big data and embedding these technologies into the very fabric of not only their IT but also their overall business strategies. Or at least they should be, with the exception of those who are still figuring it out. As cloud and big data move towards the Plateau of Productivity Gartner predicts the focus will be more on how they are applied to address industry – and business-specific needs and opportunities, and less on the innovations themselves . Is this really news? Cloud and big data experts everywhere are blogging their hearts out alerting us to this fundamental need to understand its application. The IT profession, as well as business strategy and models, are shifting due to the cloud. Cloud and big data are being stated as being critical factors that can make or break careers. Let’s not take their word for it, and dig into this ourselves. The 5th Annual Trends in Cloud Computing study from CompTIA found there is much confusion about the fundamental principles and definitions of cloud computing amongst practitioners and users. Let’s pause here while you let that sink in. These are the basics of what cloud is, public vs private cloud, and key IT skills required for successful adoption of cloud and big data which are currently lacking. There are 100 positions per qualified cloud professional in the US. Secondly, as predicted and should be the case, many companies have experienced the shift in how they perceive IT due to the cloud. The CompTIA 4th Annual State of the Channel study affirms this, finding 40% of the respondents stated their business was pushed in new strategic directions because of the cloud. Some companies are downsizing their IT department as cloud services push more of the technical elements to external providers. However, IT now plays a critical role in line of business decisions which are much more integrated with technology. Thus driving the need for specialized IT staff and IT professionals with a broader knowledge of the business. 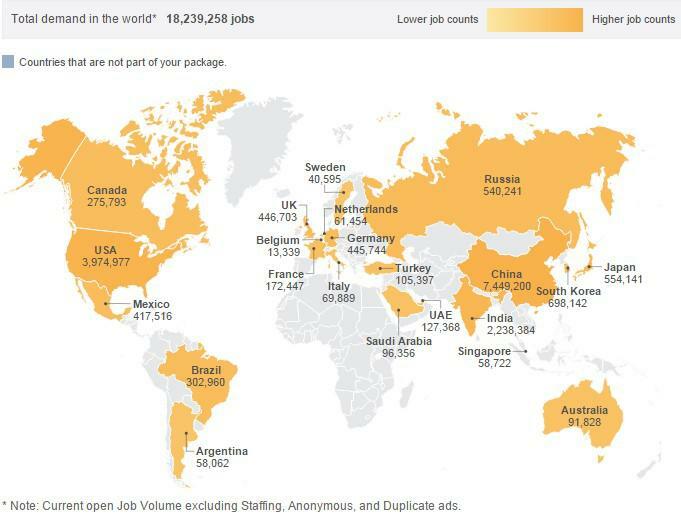 Forbes did an exhaustive analysis of WANTED data sizing the demand for cloud skills globally and reported 18,239,258 cloud computing jobs going into 2015. Interestingly, the market demand shows a need to add cloud skills to existing IT skills. In summary, they found a demand ratio of 100 positions per qualified cloud professional in the US. CompTIA’s Annual Cloud report already shows cloud providers also face a human capital challenge to meet the rising demand for cloud services. Up to 40% of firms identify the learning curve as a key challenge. 23-34% were also challenged by vendor lock-in, the variation occurs at different stages of the cloud adoption. 44% had moved their cloud infrastructure or applications since adopting cloud – an exercise they cited as being costly and more difficult than the initial migration itself. Companies are finding it difficult to shift their business practices along with their new cloud strategies. 56% of respondents cite developing cloud expertise as a major hurdle. In general, the CompTIA State of IT Skills research found 93% of organization acknowledge an IT skills gap, and 60% recognize a major gap. What can training providers get from this? Perhaps the most surprising part is what insight can be drawn from this, what are companies doing about it? 66% want to either outsource or hire new staff, which is unlikely to work given the high demand for skills that is currently unfilled. Immediately you start to wonder how sustainable it is to outsource or hire contractors, or even find skilled people in the market when dealing with cloud computing. It’s time to invest in the professionals meant to implement cloud technology into the fabric of corporate strategy, as the future is set in the cloud. How are more IT staff not being (re)trained as the first, pivotal and immediate logical step to cloud adoption? Lack of appropriate training or relevant cloud certification? We know this is not the case. It only took a simple Google search to pull up this neat little article which lists 86 cloud certifications, from 19 vendors. Sure, most are vendor specific training and don’t help the vendor lock-in risks, or gain a broader understanding of business to enable companies to restructure their processes. However, there are some strong vendor-neutral contenders in the certification market. It doesn’t take long to dig, and it could save millions in IT budgets to have a plan, and invest in the right skills to execute that plan, the first time. Cloud and big data are no longer hype, reality has set in. It’s time to invest in the professionals meant to implement cloud technology into the fabric of corporate strategy, as the future is set in the cloud. Trainers, consultants, and managers all need to align and equip their teams, technical and line of business, to get the relevant (re)training in order to successfully adopt the cloud. The sooner companies and professionals understand this, the stronger the move to the Plateau of Productivity along the Hype Cycle. As many professionals have already pointed out, we’re otherwise left to try and retry cloud implementations in costly and inefficient re-restructuring as 44% have been doing thus far. Browse ITpreneurs’ portfolio of cloud certifications and training including the vendor-neutral Cloud Credential Council (CCC) big data and cloud certifications. The CCC offers several cloud certifications from associate to architect level. Are you an ITpreneurs partner? Have your instructors sign up now for a free train the trainer session and get certified to deliver the CCC certification in your domain. Non-partners can easily become a partner and are welcome to join the TTT as well. This post is a guest contribution from Peter van Eijk, in collaboration with ITpreneurs’ editors. Peter van Eijk develops and delivers workshops for swift and secure cloud adoption. He has worked for Deloitte Consulting, IT supplier EDS, internet providers, and at the University of Twente, where he received his PhD in 1988. He is the co-author of the Cloud Credential Council (CCC) Cloud Technology Associate (CTA) certification syllabus and provides training for the CCC Professional Cloud Solutions Architect as well.